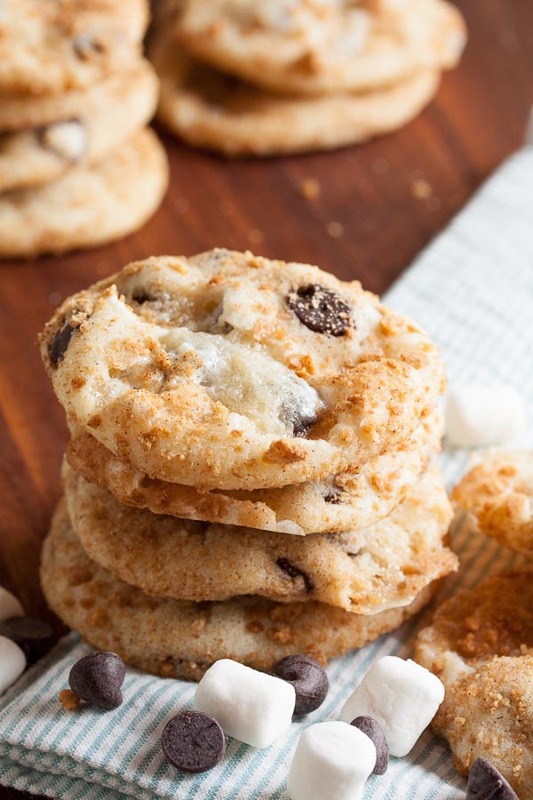 S'mores Cookies | wanna come with? Normally I’ll pick my weekly cookie recipe based on what I happen to feel like making. This week, however, we have a special request. One of my coworkers (one of my favourite coworkers) is leaving us. Boo! But before she leaves, she’s asked for a couple of going-away cookies. 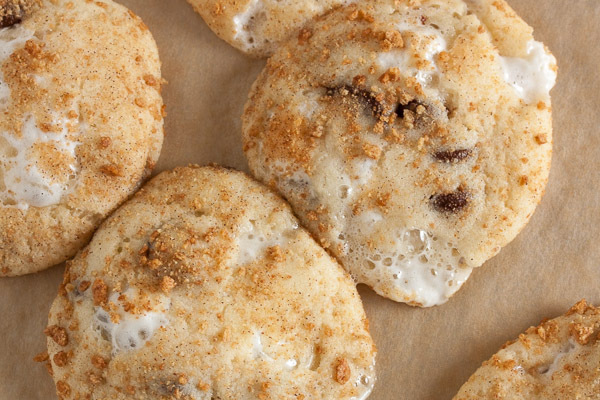 And one of them is s’mores cookies. She’s actually the reason I made the last s’mores cookies I tried, too. See how much I love my coworkers?? This should come as no surprise – my coworkers are awesome. When I made those chocolate s’mores cookies, I did a lot of reading about what happens to marshmallows when they’re baked. While many recipes just say to add the marshmallows to the cookie dough the same as any other inclusion, there were a few recipes that warned against doing that because the marshmallows would melt away to nothing. The cookies I made last time got around that issue by adding the marshmallows to the top of the cookies just before they’d finished baking. They turned out great! This time, however, I wanted to try a cookie where they’re just included in the dough. You know, for science. Well, they definitely melt alright! And stick to everything in sight (don’t even think about making these without parchment paper!). But they didn’t disintegrate as I was led to believe by some of the other recipes. They didn’t end up looking bad at all! I’ll admit, some of them are a bit of a mess (they spread out and joined together and the marshmallow made it more than a little difficult to separate them), but man oh man, they taste fantastic. And since the marshmallow does get melty, once the cookies have cooled they have more of a chewy texture. This particular recipe has a lot of inclusions compared to the amount of dough. Really, what you end up with is more like a big bowl of chocolate chips and marshmallows with just enough cookie dough to hold it together. 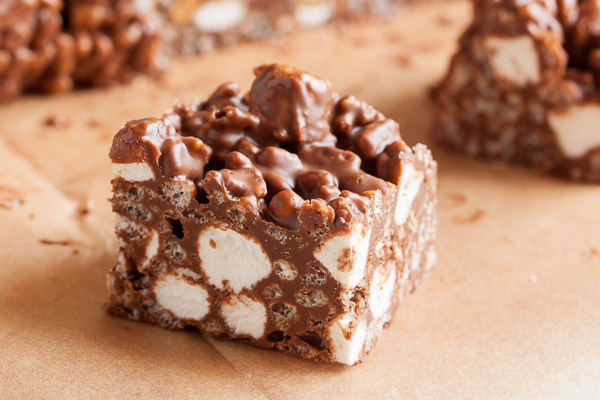 You could probably cut the amount of marshmallows in half and have something much more manageable (I’ll make a note of that in the recipe below). 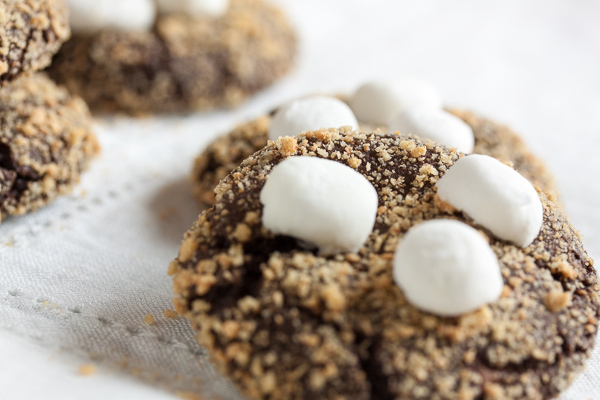 I’ll admit, I think I preferred the previous recipe over this one – it was a chocolate cookie with even more chocolate added, rolled in graham cracker crumbs and then topped with marshmallows – what’s not to love? But I think this one was the more popular among my coworkers. Don’t get me wrong – the other cookies were popular too! But this time there were a lot of yummy noises and a lot of coming back for seconds. And all 65 of them were gone within just 2 days. Long story short? They’re both good cookies, just in different ways. Be very careful when moving these from the baking sheet to the cooling rack – fresh from the oven, everything about them is soft and melty and they’ll fall apart very easily. 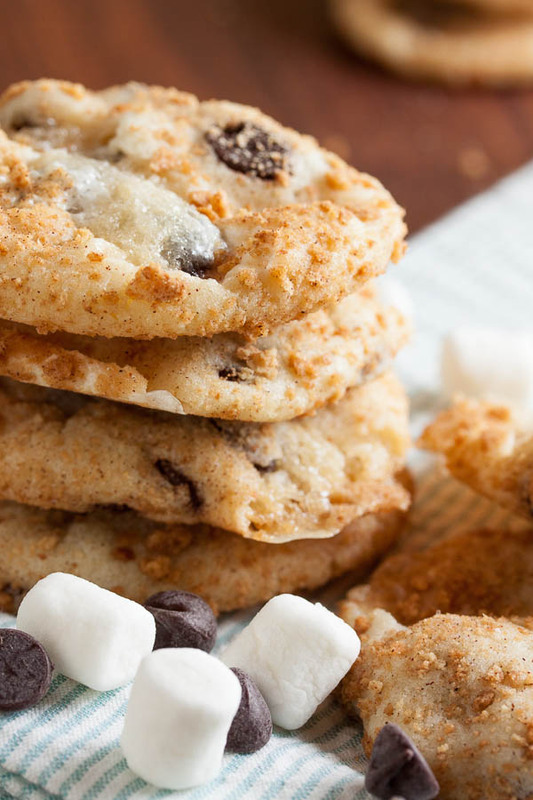 Remember – it’s just a pile of chocolate chips and marshmallows, with very little cookie to hold them together. I left them on the parchment sheets until they were mostly cooled and then peeled them off. Adapted from Milk & Cookies by Tina Casaceli. 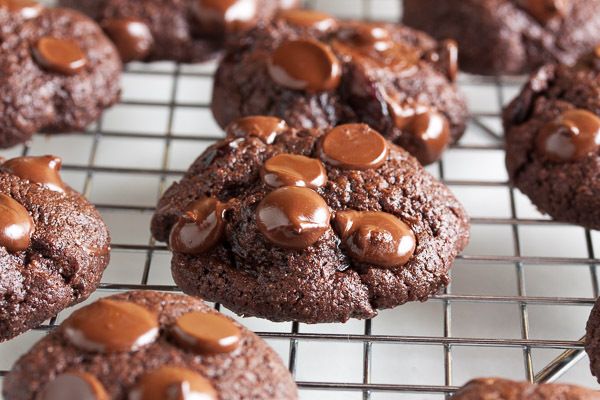 The original recipe says it makes 2 dozen cookies, but much as I love this cookbook, I find the quantities are always underestimated – I got 65 cookies. In a medium bowl, whisk together the flour, cream of tartar, baking soda, and salt. Set aside. In the bowl of a stand mixer fitted with the paddle attachment, beat the butter, vegetable shortening, and sugar together on medium speed until light and fluffy, about 3 or 4 minutes. Scrape down the sides of the bowl and add the eggs, one at a time, beating well after each. Add the vanilla and beat again to incorporate. Turn the mixer down to low and add the dry ingredients, mixing until just barely combined. 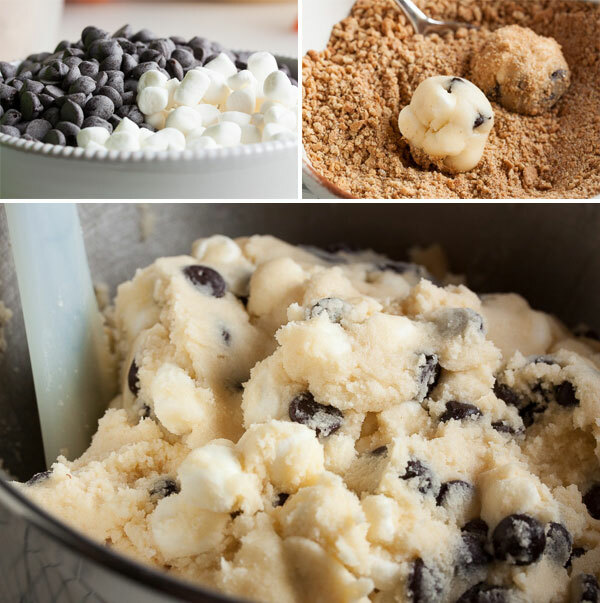 Remove from the mixer and add in the marshmallows and chocolate chips either with a spatula or by hand. I prefer to knead inclusions in by hand to ensure they're distributed evenly. Cover the dough with plastic wrap and refrigerate for about an hour. In a small bowl, mix together the graham cracker crumbs, 1 tablespoon of sugar, and cinnamon. Form the dough into small balls, about 1-1/4” diameter, and roll each in the graham crumb mixture, coating completely. Place them onto the baking sheets about 2 inches apart to allow for spreading (these cookies will spread out quite a bit, so don't crowd them). I highly recommend using parchment paper on your baking sheets – the marshmallow in these cookies melts and sticks to everything. Bake for about 12 minutes, until lightly golden brown, rotating the baking sheet halfway through the baking time. Allow to cool on a wire rack for a few minutes before removing the cookies from the pan and allowing them to cool completely. These cookies are very gooey when warm, so I found it best to keep them on the parchment paper until they were almost completely cooled.